Hey Folks, I decided that since I had outlined on what you should be looking for to better one’s play style stepping into arenas and battlegrounds, I would also breakdown the schemes of how you would approach your opponents on a spec and class basis. As a shadow priest, you hold an advantage over a lot of damage dealing classes by being dot based, however, 4 of your spells have a cast time, so you are also one of the most vulnerable to spell locks and spell interrupts. Note: All of these analyses are based on your opponent is of equal gear and skill set as yourself. Frost/Unholy: (VW) – Death Knights are the bane of shadow priests out there, and being disc generally only delays the inevitable. While all DKs have the same counters to your abilities, frost and unholy will end up wasting you that much quicker. AMS to stop all dots, reduce damage by 75%, and stop mind flay from being cast, combined with lichborne and a pvp trinket for 2 fear breaks, (one for fear, the other for psychic horror). Not only an interrupt, but a silence to boot, and its capped off by one ability that gives all mana users fits, Necrotic Strike. 30% slower cast time AND absorbs healing on you. If you have the option of fighting a DK or someone else, fight someone else. Blood: (E) – With the great vengeance nerf that came to pvp, nuking a blood Dk (or any tank for that matter) doesn’t power them up like the incredible hulk when you hit them. They still possess the same anti-priest counters their dps counterparts have, but will not have the damage output. Their self-healing is also tremendous, but their blood shield only absorbs physical damage. You should be able to live long enough for your fear to come off cooldown and tip the scales back in your favor. *Hot Tip for DKs* – When approaching a Death Knight, open with your silence ability, this will prevent a ton of things from happening. They will not be able to use Death Grip, Strangulate, AMS, Mind Freeze, Icy Touch, Chains of Ice or Howling Blast for the duration, this enables you to get a small amount of damage in while they basically are helpless. They can choose to trinket your silence, but that will leave them vulnerable to one of your fears, giving you a better chance to survive one. Restoration: (VS) – Somewhere out there, I just lost a handful of readers. As a shadow priest, Resto Druids are the least troublesome for how they can CC/snare/avoid you in terms of killing them. They have, at most, 2 forms of CC, the first being cyclone, and the other being Bear Form + Bash. If they end up using the second option on you, it means they aren’t healing (something). Aside from Living Seed, Barkskin, and Replenishment, two of which they need to spec into, you are able to dispel any buff a druid casts on themselves. A resto druid can only dispel two of your dot spells, and run the risk of fearing themselves and anyone near them for 3 seconds if they choose to do so. (They also need to spec into that cleanse.) They certainly have the potential to run you oom on your own, especially since if you dispel lifebloom, you will heal them for a lot. There are two tricks and tips for fighting a resto druid that will drive them nuts. *Hot Tip 1 (Resto Druid)* – That wonderful spell that healers love to hate, Mana Burn. A resto druid does not have an interrupt like Paladins or Shamans do, nor the counter move in silence like priests do. They only way they can stop mana burn is to outrange it or take the lesser of two evils route. You want to make them choose either eating a mana burn, or shifting into cat or bear so that mana burn has zero effect. However, by shifting into cat/bear, they stop healing for at least 2 Global Cooldowns, thus putting more pressure on them to catch up. Balance: (S) – Much like yourself, they balance druid, relies heavily on their dots and then a strong ramp up, without being attacked or silenced. If paired with the glyph of dispel magic, you can effectively heal yourself for 6% of your health every time a druid hits you with Insect Swarm/Faerie Fire/Moonfire. Moonkins also have no counter to your dots, such as, they can’t dispel them. They have no reduced duration on either your fear, silence, or psychic horror, and you can fear their burst (treants) away rendering them useless. The only vulnerability you have against a resto druid is if you are slow to dispel roots off of yourself and get caught in their solarbeam. It will be a 10 second silence should you be unable to move out of it. I would recommend using dispersion here, because even using the trinket to get out of roots will still keep you silenced, and dispersion will reduce all that damage they are unloading by 90%. Feral (Cat) (E) – Ferals tend to present a challenge for priests, their slowing debuff is a hindrance, their bleeds hit hard even with resilience and damage reduction from Inner Fire and Shadowform, and they are immune to your Psychic Horror, and when I say immune, they certainly are not immune to being feared in place for three seconds, but the disarm portion has no effect on the damage output a feral will do to you. They also have a short interrupt that if they switch to bear, can use at short range instead of melee. If they use tiger’s fury and berserk immediately after each other, they can burst you down very quickly, even with a dispersion. *Hot Tip (Feral Druid)* – I know its almost an impulse reaction (even on my part) to immediately hit your fear when a melee jumps you. For ferals, you may not want to be so quick on using fear. If you use psychic horror as your first CC and get them to burn their trinket getting out of it, you can then fear them for the full 8 seconds, instead of using fear, having them trinket, and then only getting 3 seconds out of psychic horror. That 5 seconds can make a world of difference in surviving. Beast Mastery: (S) – Playing a beast master all comes down to how well you use the terrain to your advantage. It may also be a good idea to eliminate their pet, considering that’s whats going to deal a hefty chunk of damage to you. Combined with its intimidate and Bestial Wrath, you can be torn to shreds in that 4 second duration. If you find yourself in the open, you are going to have to play close quarters combat and deal with snake traps and whatnot to minimize what a hunter can do to you. Since they can’t dispel your buffs, kiting is a viable way to wear them down, a but a good use of your abilities should tip the battle in your favor. Marksmanship: – Marksmen, combined with the right pet, are lethal for any caster class out there. You already have scatter shot, now add in, the traps, a silence on a 20 second cooldown, and readiness to rest the cooldowns on all your abilities and you have a recipe for some very big time headaches. The amount of sheer damage they can put out is very high in addition to all the various types of crowd control, you will need to make very efficient use of your terrain to stand a chance. *Hot Tip (Hunters)* – Get into a hunters melee range asap. Ideally you want to fear them and get them to trinket out right away. What this will do is allow you to psychic horror them and leave them dealing with the disarm/fear. If they are good, they will have a weapon chain on and only be disarmed for 4 seconds, if not, you get the enjoyment of them not being able to attack for 10 seconds. Arcane: (S) – The famous one button mage. They become tricky if they get the jump on you, especially with Arcane Power, Mirror Images and Time Warp active. It may turn into a nightmare quickly. The nether vortex talent, while dispellable, will slow your movement and casting by 30%, however, its refreshed so often, they only way to escape is outrange or LoS. However, you good silence is enough to get a full set of dots on them and then kite, throwing a psychic horror in for good measure. Adding your shadowfiend as a pet will eliminate the mage quickly. Fire: (VS) – Its almost like Christmas when you see a fire mage. All of their damage, save for Scorch, Pyroblast, Pyroblast(Dot), and Fireball are dispellable, which means you get to enjoy being hit for relatively low amount of damage, since fire mages wont be hard casting fireball or pyro in any pvp scenario. Fire mages will fight in close quarters though to make use of their Blast Wave and Dragon’s Breath abilities, so do try to keep your distance as much as possible to avoid those CCs. Frost: – The amount of control a frost mage has is ridiculously absurd. Sure all of their slows are dispellable, but you can either spend your time dispelling and not doing damage, or trying to do damage and being rooted/frozen/slowed/etc. You can easily survive a burst of a frost mage, if you get caught in a deep freeze by just dispersing it. However, the cold snap ability brings everything right back off of cooldown for them to do it again. Silence and Psychic Horror will definitely your biggest timing abilities here, but even with those, the amount of damage Ice Barrier and Mana Shield absorb may be too much from an equally skilled opponent. Retribution: (E) – Ret paladins have a nice tendency to be very bursty about their dps, however, you can dispel all of their burst rendering it null and void. They do have the melee interrupt in addition to Hammer of Justice. They key to a ret paladin is trying to figure out just when they are going to bubble. Silence and Psychic Horror will not stop the bubble, but if you can pinpoint when the bubble is coming, you can pre-cast Mass Dispel and take the bubble off right as they activate it. Ret paladins can close quick and censure can stack quickly, most ret paladin fights you have will be very close. *Hot Tip (Ret Paladins)* – Sacred Shield. The one thing that may give you fits is this ability. Not only does it seem like it absorbs an obscene amount of damage, but they can also heal themselves with Word of Glory 20% better while active. To minimize this, when you see a paladin getting below 40% health you want to line up a string of spell that will cause their health to drop below 30% but also under 25% before the shield activates. This will allow you to shadow word: death twice, and quickly eat through the shield so you can finish them off. Holy: (E) – Holy Paladins, while having no real offense, do have a number of ways to make things annoying for a priest. They can dispel all of your dots, if they get into melee range they can interrupt you, they can stun you, and they can bubble, forcing you out of dpsing or mana burning to remove the shield. The one big ability they have for clutch situations is Aura Mastery. *Hot Tip (Holy Paladins)* – Aura Mastery from holy paladins can drive shadow priests berserk. Bursting down that target and getting ready to silence the healer? Aura Mastery just trumped your silence and laughed at it. When fighting a holy paladin at low hp, stay in close quarters. If they are about to use aura mastery, and you see it activate (looks similar to Fear Ward’s animation), don’t silence them and waste it, use your fear. If your fear is on CD, use your psychic horror, this will not only CC them, but it will also chew up all of those seconds that aura mastery has left. Protection: (S) – Again, since the nerf to vengeance, they won’t really hit hard as a significant threat to your health. They share the same stuns and interrupts as the other specs of paladins, and they gain avenger’s shield, which will silence and daze, but because they will use it so frequent in their opening attacks against you, the silence portion will go on DR very quickly. A fear hear, a silence there, and a psychic horror to drop their shield should make very easy work of them. Holy: (S) – The only thing holy priests have for them is blessed resilience and Guardian Spirit. They do not enjoy the luxury of bigger bubbles, bubbles on crit, 24% extra healing from grace, Focused Will, Pain Suppression, nor Power Infusion or Barrier. They can escape your mind flay snare with the pvp 4 piece bonus combines with body and soul, but its only an escape. They wont have the time to mana burn or try and CC you, the damage you will be doing will pt way to much pressure on them to continue to heal and move. Discipline: – By far the worst healer you can encounter as a shadow priest in battle. They can dispel your dots, bubble themselves to absorb a considerable amount of damage while in turn trying to mana burn you, pain suppression for even more reduction, power infusion for faster mana burns or more damage from another caster ally, focused will for 20% less damage taken. The Coup de Grace is rapture, so even when you starting runnng them low on mana, they can still get 6% of their mana back each time their shield is absorbed completely or dispelled, if done so in certain intervals. Shadow: (E – Huge shocker, didn’t see that a mirror would be an even match at all!) – Getting the advantage on a shadow priest all comes down to who needs to use their CC first. The person who uses their Silence and Psychic Horror first is usually the one who is at a disadvantage, because in a utopian world, the two of you would just trade off CCs, with the last person getting the most time to benefit from the chain of control. Ideally, if you can get all your dots up on a shadow priest before you need to use silence, you should be a great advantage, unless you run into a dispel happy priest (like myself) in which case a little burst of mind spike to put them on the defensive would be your best play. Assassination: – The deadly brew talent is going to be a thorn in your side, since whenever they apply poison to you, it will also apply crippling poison. And since phantasm wont save you until MoP, you are stuck for now. Their burst is mutilate until sub-35% then backstab ramps up for them. They wont have the combo point generation a sub rogue does, but the increased energy regen from overkill may be too much for you to survive, if you can survive their trinket + cloak + vanish + 2nd opener, you certainly have a good chance to win. Otherwise, the combination of stuns, interrupts and constant slow may overwhelm you. Combat: (E) – Combat really isn’t seen much in pvp, the few times I have encountered it, it really didn’t seem very burst like, because of the ability and poison choices of the rogue attacking me. I can certainly see how adrenaline rush + savage combat + combat insight can wreck someone, I just think with the amount of CC being used by you on them (and around you), such a combination may only exist in Utopia. Subtlety: (VW) – The burst, the stuns, the silences. Sub rogues have a nasty way of torturing you with their cooldowns. One full set CCs (garrote, Kidney Shot, blind) is bad enough. Now add to that Shadow Dance (use of garrote and cheap shot out of stealth) and preparation (another instant sprint, smoke bomb, kick, etc). The only hope is that you can get a peel of you, or that you can find a way to survive this, as there is no way to avoid the burst….. or is there? *Hot Tip (Rogues/Feral Druids)* – Ever want to make a rogue or feral druid half as useful as they are? Sure you do! This scenario works mainly in arenas, but in some cubbies in battlegrounds it can too. You want to position yourself in such a way that you are standing in a corner, facing away from the corner, with the back of your character directly in line with where the two sides of the wall meet. Then place yourself directly into that corner. What this does is make it exponentially hard for rogues and druids to “get behind you”. The shadowstep and feral charge (cat) mechanics will automatically put them in the one sweet spot behind you, but after yo fear them, it becomes damn near impossible for the player to get to that spot, and thus, they can no longer backstab or shred. Elemental: (S) – Elemental Shaman have a few tricks up their sleeve, varying from grounding totem, to hex, to wind shear, but all of their damage aside from Flame shock is hard cast spells. One good silence will stop them in their tracks for 5 seconds, for good measure line up Psychic Horror right after and make it 8, and if their grounding totem is also gone, make it 16 from your fear. Elemental Shaman have some decent utility and can chase you around with Ancestral Swiftness or Glyph of Lightning Bolt, but your dots, and your ability to fear and silence will heavily outweigh their, at times, uni-linear attacks. Enhancement: – Enhancement Shaman pose a threat to anyone when their spirit wolves are ready to be used. The spirit wolves persist for 45 seconds, and basically leap to wherever their target moves to, so there is no escaping them. The wolves also stun periodically, and that combined with instant casts from maelstrom, interrupts, high burst from stormstike, and possibly and fire elemental and heroism/bloodlust tossed in there. There is a lot going on, and sometimes, just way too much to handle. Restoration: – Not as bad as discipline priests, resto shaman don’t have the capacity to mana burn and give you troubles that way. But they have much more ways of just generally annoying you than any other healer. They have no additional CC options from the other shaman specs, but versus a healer, being crow controlled or locked for that long against a healer marginalizes your effect greatly. Add into this that earth shield has 9 charges and you have on individually dispel each charge off to negate the shield, plus the fact it can be recast right away, makes them a very tough target to handle from a killing perspective on your end. *Hot Tip (Shamans)* – Be mindful of how you approach shamans, their ground and tremor totems may become the bane of your existence. While their is nothing you can do about them dropping tremor totem after a fear, it is nice to know where it is in case another fear or sleep or chamr is going out, so that you can get rid of the totem. Grounding totem however will make or break fights. If they sense a silence or nuke is coming, they will wait and allow you to start casting the nuke before dropping it right before the cast finishes. Its a good idea to have a cancelcast macro in case, that way if you see a grounding totem buff on them, you can eat it up with a shadow word pain, and then unload your silence or bigger nukes. Affliction: (E) – Affliction locks will function the exact same way you do. They have multiple dot effects, their main nuke is a channeled spell (Drain Life vs. Mind Flay), and their silence will wander around in the form of a felhunter and opposed to you casting it. They only real performance difference is how Psychic Horror works in comparison to Death Coil. You may want to open with your instant dots on a warlock first, then fear both the felhunter and warlock together, so you cant be spell locked while casting Vampiric Touch or any other cast time spell. If you get the jump, you should come out on top, if they get the jump on you, Unstable Affliction is a hard thing to overcome. Your opponent will also try to play the LoS game with you, if they do that, make sure to put some damage into their felhunter, if they lose their felhunter, they lose their silence and the 25% damage reduction from soul link. 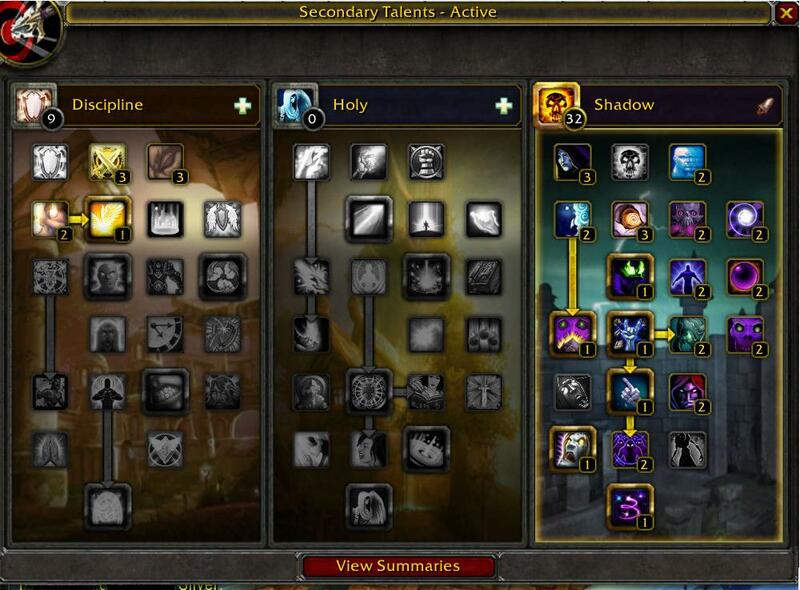 Demonolgy: (S) – Demonology locks play a bit in between both affliction locks and beast master hunters. They will send their felguard into to stun you, perhaps after trying to root you in their Hand of Gul’dan spell, and to top it all off, they will metamorph into a demon and immolate themselves to burn you while stunned, rooted, and their damage bonus is active. One quick trinket while this happens and followed by a fear, completely negates any offense from the demo lock and its felguard pet. Demo locks do tend to have a higher survivability than other locks, but if you can get your dots and your shadowfiend on them, you can kite them around for hours and finish them off with ease, just make sure to not get caught in a hand of Gul’dan, or you are going to be on the defensive. Arms: – Arms warriors are particularly nasty. I approach arms warriors like I do shadow priests. It all comes down to who has to use their cooldowns first. If you find the need to use up your dispersion and psychic horror before they use their throwdown and bladestorm, you may find yourself at the spirit healer very shortly. You always, ALWAYS want to keep your psychic horror ready for Bladestorm, its their 31 point talent and with one simple disarm, you can render it useless. You will generally not keep a warrior feared because of Berserker Rage having a similar cooldown to Psychic Scream. If you are able to juke cast** any melee who might interrupt you, you can get some channeled and cast time spell in on your opponents, just don’t get hit by a pummel, rebuke or kick, or it becomes much harder to recover. Fury: (S) – While fury does have the stacking mortal strike effect, it just does not have the utility that arms does. No improved hamstring, no throwdown, no deadly calm. The addition of bloodthirst for healing is ok, but lacking all of the aforementioned abilities to keep a target within reach is lethal for them. A good warrior will make sure to have Heroic Fury, Heroic Leap, and Intercept ready for when you fear and try to kite, make sure all your dots are up and you should have no problems kiting a fury warrior even with disperse, because they certainly wont be stunning or knocking you down anytime soon. Protection: (E) – The damage output by prot warrior isn’t a problem here, its just the amount of CC and surivability they have when facing you. Concussion blow, intimidating shout, shockwave, shield wall, spell reflect, Last stand + enraged regen, and gag order silences on heroic throw and pummel. Brutal. A good prot warrior can keep you permanently unable to do anything to them, make sure you use your psychic horror early so that you can get some dots active on them, and then go into kiting mode. *Hot Tip (Warriors)* – When warriors, especially prot warriors, sense heavy spell casting coming in, spell reflect is almost a natural reaction for them. Take advantage of this in one of two ways, you can either anticipate the reflect coming and Psychic Horror their shield off for 10 seconds, making them incapable of using spell reflect and shield wall, or you can cast SW:P when you see the icon go up, and then dispel yourself, causing their spell reflect to actually heal you. Any class with those abilities can use similar effects to gain the desired result, in fact, other classes can use different abilities, like stuns, over a fear for when a paladin uses aura mastery to get the same effect of getting the effect to expire without wasting a silence or kick. May this guide help you in seeing what your opponent has prepared for you and to handle what you are about to encounter for a more enjoyable battleground experience. And if you made it to the end in one sitting, you deserve a medal, a coffee, and someone to cook you dinner tonight, because this was taxing even for me! Thank you for reading! Its been a bit over six months since my inaugural post here and looking back, I haven’t really touched upon the area of pvp as a shadow priest in cataclysm. The thing about pvp in any expansion of WoW is that what works in one season or arenas and battleground, does not always carry over into next one based on the types of items and item sets that are released. For instance, a lot of people who do pvp will use pve items (most notably legendaries from all previous expansions and some trinkets) to try and obtain an advantage over their opponents. Dragonwrath and Fangs of the Father will have superior impact for you and your team heading into the expansion due to the procs associated with them. As a shadow priest in arena or battlegrounds, your role is 75% damage, 25% crowd control. Your three main forms of CC, each have a considerable cooldown which makes you a favorable target to the enemy if all of them have been used. You should generally attempt to stay out of the fray unless you need to fear someone off of a flag spawn or for good measure to stop a heal/counter attempt in arenas. Lets take a look at your 3 forms of usable CC in PvP. Psychic Scream – Your bread and butter spell that you have had since you were a youngling priest back in your starter zones. Despite knee jerks reactions to use this spell asap if melee are beating on you, you should probably try to wait to use this spell when multiple enemies are nearby to get the best effect out of it. Because 90% of the time, whatever melee is on you and you fear them, they will trinket out of it and resume pummeling you. There are tricks and tips to using this and outsmarting your opponent I will cover later on in this post. Psychic Horror – 25 Point talent that causes your target to tremble in horror for 3 seconds, and disarms them for 10 seconds as well. 2 Minute Cooldown. This is a must have for any shadow priest doing pvp, unfortunately it is not a baseline spell, so you will have to spend one of your talent points for it, but you can easily pick this talent up as well as having what you need in the shadow tree without losing anything major. This is an effective CC on all players, however, you should try and save this for physical damage dealers over casters, with the exception being feral druids, who suffer no penalty from being disarmed. Silence – Nothing fancy about this spell, as it does what its name says it should do, silences spellcasting for 5 seconds. 45 second cooldown. Until MoP, this is something you will have to spend 3 talent points to get, but isn;t really an option when trying to neutralize your opponents. There are a bunch of unconventional uses for this spell, particularly on melee classes, however, priority for this spell goes to healers and spellcasters after. There are two setups right now that I have found to be viable for shadow priests in battlegrounds, the first being the standard all resilience set. This includes 4 pieces from the holy/disc set, which gives you the bonus of when you PW:S yourself to not have your movement impaired for the next 4 seconds. This set will (likely) give you the most stamina and will give you the most damage reduction via resilience. You should be somewhere around 4850 resilience with full cataclysmic gear, and thats gemming with intellect in red slots, intel/haste in yellow, and intel/spirit or intel/stam in blues. This set will favor players who may not enjoy raiding, as the 403 item level will provide superior spellpower to the 397 pve counterpart. This set will also favor people who choose to be a bit bolder in their play style if they choose to, as the added resilience and stamina will allow them to survive for a good duration should they choose to rush into a foray and drop a fear. The second set is a mix of pve gear with pvp gear. This mix includes 4 pieces of the tier 13 shadow priest pve set, combines with the rest of the gear being all pvp based. This in essence turns you into a more glass cannon spec, which will increase your burst damage on targets, specifically in 2s or if a flag carrier has high stacks of focused assault. However, you are going to lose about 1200 resilience in the process, and you will be able to tell the difference in damage you take. I call it the three minute priest build, I even think there is a song for it somewhere….. I think that’s how it goes anyways, it better at least, because if I have to create another terrible remix out of a hip-hop song, WordPress may shut me down. This setup requires you to stay closer to healers for the increased damage you will be taking, it does turn out to be better as far as output if you run with people who can peel dps off of you or can cycle healing cooldowns on you well enough to get the dps to change to someone else. It also favors quick matches (2v2 double dps or vs double dps) or surgical quick strikes (2+ 1 stealth offense CTF games, flag returns). For outlasting, Resilience will always be the choice stat to go for first. Intellect will always be the next stat in line, followed by haste, crit, and mastery at the end. Try to avoid having any mastery on your gear if you can help it, it is a very underwhelming stat for pvp. Two things to note: Your hit cap for pvp is 5%, if you are well over that you can safely reforge off until that point and not worry about missing. However, to make sure you don’t encounter spell resists, you will also need to have 240 spell penetration as well. This is not hard to obtain, as any season of pvp cloak or neck has this much or more. Now you may ask yourself: “But Srs, all resist buffs give a maximum of 195, why is the cap 240 for shadow priests?” Shadow resist from a priest or paladin will stack with mages running in mage armor, this will effectively give them 240 resist that you will have to bypass to ensure you don’t end up seeing a resist. The path of the facemelter.... is... mostly enjoyable. A few things that may stand out: No Improved SW:P, No Pain and Suffering, No Shadow Apparitions. None of these talents are taken, because they center around the shadow word: pain spell, which is not a game breaker in pvp, largely due to the fact it is easily dispellable with no penalty. Most of the rest are self-explanatory. 3/3 Darkness – 3% Spell Haste, Yep. All over that. 2/2 Veiled Shadows – Minus 6 seconds to fade and minus 60 seconds to shadowfiend. This is a doubly useful talent, it allows your burst (while running 4 piece 13 to come off cooldown quicker, and it allows you to fade out of snares quicker as well. 2/2 Improved Psychic Scream – Minus 4 seconds to Psychic Scream, required for Silence. Mainly used to get to silence. 4 seconds less on fearing someone away from you, an ally or resource node helps too. 3/3 Improved Mind Blast – Quicker Cooldown on your main nuke, that also applies an undispellable 10% healing debuff. That extra 1.5 seconds helps a ton for your burst, its a general improvement for non burst as well, just watch you don’t get spell locked on this or Vampiric Touch. 2/2 Improved Devouring Plague – This is a finicky talent. The nature of DP is low damage over a long period of time, however the 30% initial damage is helpful to chip away at opponents health and can be used as a second execute with SW:D if needed. 2/2 Twisted Faith – Filler talent. 2% Shadow spell damage is very minor, the spirit to hit conversion allows you to focus on more damage based throughput like haste and crit instead of going all hit gear. 2/2 Phantasm – Allows you to break snares without having to disperse or pvp trinket out of it, it very powerful with the right spec and glyph choice. 2/2 Harnessed Shadows – Every time you get crit, you gain a shadow orb for your nukes, stacking up to three, great talent that shines after being crit a few times and then paired with your fear. 1/1 Silence – Your clutch CC ability. Self-explanatory. 1/1 Vampiric Embrace – Passive healing from all your shadow damage, required for Vampiric Touch. 2/2 Masochism – 10% Mana back when you take 10% or more of your health and damage, or are hit with recoil from SW:D, mostly a filler talent, nice if you have mana issues and also happen to be the kill target, but most people will ignore an Oom shadow priest for that very reason. 2/2 Mind Melt – Instant Mind Blast Crits and reduced damage taken from SW:D recoil, all over that. 1/1 Vampiric Touch – Your most powerful DoT in terms of damage, and will fear any target near the person who dispels the debuff for 3 seconds with no diminishing returns. 2/2 Paralysis – Mind Blast crits root the target for 4 seconds. Great for isolating someone in the map, however it is dispellable, choose your targets to root carefully, ideally with 3 mind spikes then a mind blast. 1/1 Psychic Horror – Secondary CC, highly effective against physical damage dealers. Because of the longer cooldown, this spell is a bit more touch and go for when to use it, opposed to silence. 2/2 Sin and Punishment – 100% chance that your VT will fear anything within 6 yards of the dispelling target, and every time your Mind Flay crits, the remaining cooldown on shadowfiend is dropped by 10 seconds. A very versatile talent that allows for increased burst opportunity while providing a secondary CC in the presence of dispel happy healers. 1/1 Dispersion – Pretty straight forward, the mana return is nice, but the damage reduction is the main use for the spell in moments where you just so happen to get death gripped by a DK followed up by a rogue stun. Call the Inscriptionist...... I mean Scribe, SCRIBE!! Shadow only has 4 glyphs total, 2 of which are musts for pvp, the other is a flex. 1) Glyph of Mind Flay – +10% damage to your main offensive spell. Take it. 2) Glyph of Shadow Word: Death – Gives you a second execute, for if the first doesn’t get the job done. Take it. Flex Glyph: Glyph of Shadow Word: Pain versus Glyph of Dispersion. Neither are highly appealing for pvp. In either the burst or conventional setup, shadow word: pain can still be easily dispelled making the glyph and subsequent talents associated with it, moot. Likewise, dropping the cooldown on dispersion by 45 seconds implies that you may be thrusting yourself into the center of action a bit too much or aren;t getting anything peeled off you. I prefer to use the SW:P glyph for my burst, forcing healers to worry about keeping the target alive first, and then dispelling later. I would strongly consider taking they dispersion glyph over SW:P if they replaced the current effect, with something similar to the glyph of Evocation, where you would regenerate 5% of your health every second for 6 seconds, instead of dropping the cooldown by 45 seconds, but that may be a tad OP. At least the major glyphs gain some appeal for the pvp side of shadow, whereas they are extremely lackluster for all cases of pve right now. 1) Glyph of Fade – Reduces the cooldown of fade by 9 seconds. Paired up with Veiled Shadows, this drops the cooldown to 15 seconds, which means you can fade out of snares that quickly. Take it every time. 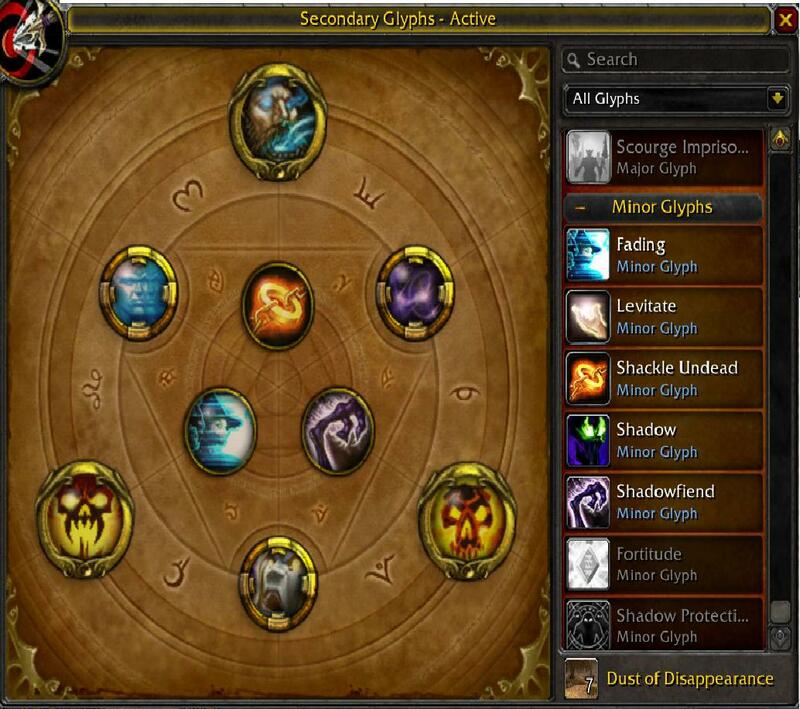 2) Glyph of Psychic Horror – Reduce the cooldown of Psychic Horror by 30 seconds. Reducing the cooldown of one of your CCs? Sign me up. Flex Glyph: Glyph of Dispel Magic versus Glyph of Fear Ward. You have the choice of reducing cooldown on how often you can be feared as a form of CC, or healing yourself if you are actively aware of your debuffs when attacked. Fear does not bother me, I know not the meaning of it. Whereas it is really beneficial if you have a moonkin, fire mage, or aff lock dotting you up (before Unstable Affliction) and watching as your health goes up, instead of down. Ideally wait for 2 magic debuffs to be applied, and then dispel to get a 6% heal and maximize its effect. I am going to be labeled as an absolute heretic for when I post my choices, so I may as well get it out of the way and say that I DO NOT HAVE GLYPH OF LEVITATE IN MY CHOICES. And you may now proceed to point, laugh, and mock. There is really no flex glyph for minors, as all three I have, believably, serve good purpose. 1)Glyph of Shackle Undead – Reduces the mana cost of shackle undead by 50%. Helpful for the Ghoul Pets, Gargoyles and Lichborne used by death knights. A good trick here is fearing a death knight, having them use lichborne and then shackling them. 2) Glyph of Fading – Reduces the mana cost of fade by 30%. Depending on who your fighting for how long, you might be using fade quite a bit to get out of snares while expending mana to dps and CC, every little bit helps. Take this. 3) Glyph of Shadowfiend – When your shadowfiend is killed, not expires, you get 5% mana back. In pvp situations, people will try to CC your shadowfiend as best they can (most notably with fear). If you decide to fear ward it and make it immune to that CC, chances are people will attack it to stop your burst, and the result is you getting 5% mana back. A loss in the end, but it still curbs the loss somewhat. This setup should help you prepare for doing pvp on a regular basis, and should serve as a primer to help you have an enjoyable experience in the battlegrounds, or at least as much as you can on your end. Because lets face it, sometimes you just end up getting people who do not have any idea how to do pvp, or they are a fresh 85 queuing up with 75,000 hit points. This should ensure that you at least have the capacity to perform well on your end. If you disagree with my spec and glyph choices, tinker with ones you think would work better. Trial and error is always the best way to find something that suits your playstyle. PvP can be a very frustrating experience, especially running into premades, I hope this guide helps your experience in a positive manner, and thanks for reading!